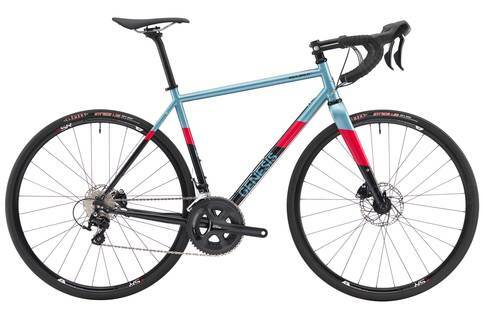 Genesis Equilibrium: Read review of popular all-rounder. If you want a well performing bike that has the additional advantage of looking good, then the Genesis Equilibrium is a good choice. This bike has a Chromoly frame with a carbon fork. It weighs a little more than 10 kilos in total. This is a bit of an expensive buy. The Genesis Equilibrium is certainly one of the more stylish road bikes that we have seen around. The design comes from the fact that Genesis has labelled this particular line of bikes, ‘road sportive’. Well, it definitely looks the part. As with all road bikes, the Genesis Equilibrium has a lot to live up to. It needs to be fast, comfortable, and do well with various terrain. The Equilibrium is quite fast and works well as a commute option, particularly if you are not looking for a leisurely pace. While it is far from heavy, a little bit of extra weight does hold the Equilibrium back from being truly speedy. Nonetheless, it will work just fine as long as you do not go entering any races. The Equilibrium also proved to be quite comfortable which means that you won’t find yourself hobbling off the bike once you are done. Last but not least, for the most part, this bike rides wonderfully on many different terrain. However, if we did have to make a complaint it would be about the Equilibrium’s ability to get uphill. It will certainly manage to do it but it will require a considerable amount of effort on your part. It is easy to forget all about this, nonetheless, the second that you start heading down the slope. The Equilibrium then becomes its delightful self once more. If you do not mind springing for the cost, then the Equilibrium really is a great buy. This is especially true if you plan on using this bike on a daily basis as you are really getting your money’s worth for it. While a bit expensive, the Genesis Equilibrium is undoubtedly a reliable and lively companion, especially if you require a bike for your daily commute. The Genesis Equilibrium, although not perfect, is definitely a wonderful bike to ride around. It is a versatile road bike by Genesis.